20mph speed limits on most streets and roads in Bristol has been one of Bristol Cycling’s campaigns (Twenty’s Plenty) from the beginning. We encouraged as many BCyC members as possible to respond to the consultation in 2018 (7 Reasons Einstein would support 20 mph) and we were pleased at the overwhelmingly positive response the council received. 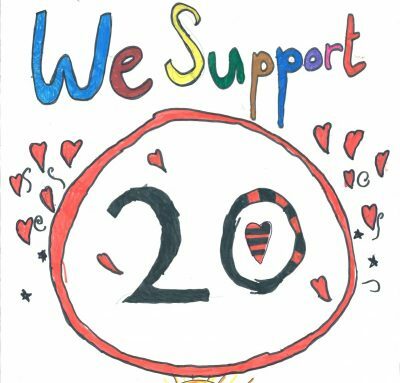 We put in our own formal submission as well, as below or click here Response to 20mph consultation 2018. The ability to cycle safely on low speed, low traffic streets is essential in providing a comprehensive cycle network in Bristol. In 2017 Avon and Somerset Police recorded 232 injuries to cyclists in Bristol. Based on the Department of Transport’s estimates this is likely to be a significant under-estimate of actual numbers. Despite this Bristol Cycling Campaign believe that 20mph speed limits have made a meaningful difference improving conditions for cycling in Bristol and we strongly urge the 20mph limits to be retained. The UWE BRITE study supports the effectiveness of 20mph speed limits in reducing deaths and serious injuries, saving an estimated 4 lives and preventing 170 injuries every year, and as a result saving an estimated £15m of public money by doing so. Nor is there any clear rationale for relaxing limits. Commercial research undertaken last year by ‘In Car Cleverness’ suggests that average traffic speeds within a 5 mile radius of Bristol City Centre are under 13mph. Increasing speed limits would only have the effect of encouraging stop-start driving and extending waiting times at pinch points and junctions, compromising road safety in the process. Bristol Cycling Campaign estimate there are 28 schools on or immediately adjacent to roads being considered for higher speed limits as part of this review. Increases to these speed limits would negatively affect the safety of children in these areas and others. A vehicle travelling at 30mph has more than double the kinetic energy of a vehicle travelling at 20mph dramatically increases the stopping distance and the risk of a pedestrian being killed in the event of an impact. Reduce air pollution and fuel consumption. 20mph reduces acceleration of vehicles, the most energy intensive stage of driving. Braking from 20mph instead of 30mph puts less energy through brakes, tyres and the road surface. Thanks to this lower energy a fully enforced 20mph limit would reduce air pollution from exhaust and non exhaust emissions. Reduce noise. Numerous studies have shown that cars travelling at 20mph instead of 30mph a perceived as generating half the noise. Reduce congestion, through improved vehicle flow. This is not shown in the council modelling because city-wide models are macrosimulation (average speed models) they assume a vehicle travels at steady speeds across the city and stop start behaviour is not included. Given the benefits outlined above Bristol Cycling Campaign believe there is no negative effect for imposing speed limits which are ‘too low’ for a given road and urge that where non-compliance with the existing speed limits is high that traffic calming and enforcement measures are introduced to bring average vehicle speeds down to compliant levels rather than compromising road safety by relaxing limits. Bristol Cycling Campaign believe these measures should be combined with traffic reductions measures to reduce through traffic and vehicle movements generally in residential areas via filtered permeability of traffic modes favouring walking and cycling. This would both improve road safety for pedestrians and cyclists, and improve residential streets as a place to live. Bristol City Council is currently considering the options for a Clean Air Zone (CAZ). The same technology proposed for this could be used to enforce 20mph, providing a list of benefits, that if conveyed to the general public, could be more popular than a CAZ.